Second floor unit - 1200 sq. ft. Located just 2 miles west of Disney. Shuttle bus service to local attractions and amenities. 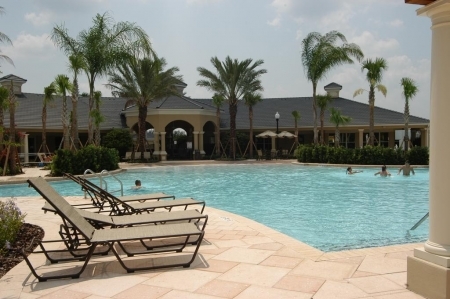 Windsor Hills Resort is a gated community, located in Kissimmee, FL, just 5 minutes, 2.1 miles from the entrance to Walt Disney World! 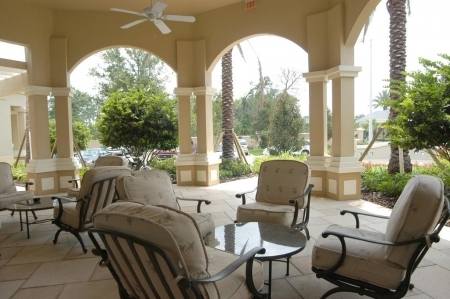 Built in 2005 by Pulte vacation homes, Windsor Hills has everything to make you feel at vacation home, yet pampered by lush surroundings and many amenities. Some of the magnificent features of this guard-gated community include a luxurious water park pool and clubhouse with fountains, waterslide, and a hot tub lagoon spa. The amazing clubhouse over-looking the pool has a game room, HD movie theater, state of the art fitness center, and has billiards tables, and a video game area, a sundry shop, fitness room with top of the line fitness equipment, high definition surround sound movie theater, and other outdoor recreational activities such as outdoor poolside ping pong, all surrounding the heated Double Olympic Size Swimming Pool with waterslide! The clubhouse and lagoon hot tub area are set next to a beautiful wetlands area, amidst lush tropical landscaping throughout the whole resort. Play outdoor ping-pong next to the amazing resort pool, or take the Windsor Hills shuttle to one of the many close theme parks, or play golf at one of the many Orlando championship courses, we\'re right next door to Mystic Dunes! (2 rated course in Orlando area). Our vacation rental condo has three bedrooms and two bathrooms. We have 4 TVs each with DVD players. We have a stereo with CD player. We also have free wireless high-speed Internet access if you travel with a laptop computer. 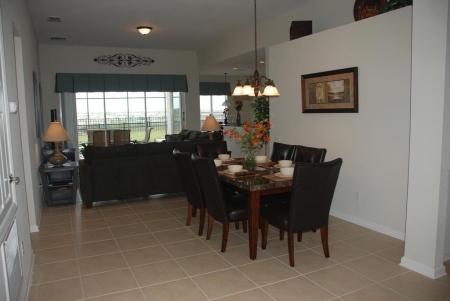 Our condo is fully equipped with everything you need for a great economical vacation. The kitchen has a full stove and refrigerator, dishwasher, microwave, blender, coffee maker, pots and pans, and all the dishes and utensils for making easy and complex meals. Our condo also has a full size clothes washer and dryer. We are conveniently located in the resort just a couple minutes walk to the clubhouse and swimming pool. We are on the second floor, facing west. (The stairs and elevators are close by.) The condo is outfitted with king, queen, and two twin beds. We also have a couch/sofa bed, which is queen size. Linens and towels are provided. We ask for a deposit of $150, which is deducted from the total due for your stay. Unlike others, we guarantee you a full refund on any money paid to us if you need to cancel for any reason at any time.